The Service Process Matrix is a classification matrix of service industry firms based on the characteristics of the individual firm's service processes. The matrix was derived by Roger Schmenner and first appeared in 1986. Although considerably different, the Service Process Matrix can be seen somewhat as a service industry version of Wheelwright and Hayes' Product-Process Matrix. The Service Process Matrix can be useful when investigating the strategic changes in service operations. In addition, there are unique managerial challenges associated with each quadrant of the matrix. By paying close attention to the challenges associated with their related classification, service firms may improve their performance. The classification characteristics include the degree of labor intensity and a jointly measured degree of customer interaction and customization. Labor intensity can be defined as the ratio of labor cost to plant and equipment. A firm whose product, or in this case service, requires a high content of time and effort with comparatively little plant and equipment cost would be said to be labor intense. Customer interaction represents the degree to which the customer can intervene in the service process. For example, a high degree of interaction would imply that the customer can demand more or less of some aspects of the service. Customization refers to the need and ability to alter the service in order to satisfy the individual customer's particular preferences. The vertical axis on the matrix, as shown in Figure 1, is a continuum with high degree of labor intensity on one end (bottom) and low degree of labor intensity on the other end (top). The horizontal axis is a continuum with high degree of customer interaction and customization on one ends (right) and low degree of customer interaction and customization on the other end (left). This results in a matrix with four quadrants, each with a unique combination of degrees of labor intensity, customer interaction and customization. The upper left quadrant contains firms with a low degree of labor intensity and a low degree of interaction and customization. This quadrant is labeled "Service Factory." Low labor intensity and little or no customer interaction or customization makes this quadrant similar to the lower right area of the Product-Process Matrix where repetitive assembly and continuous flow processes are located. This allows service firms in this quadrant to operate in a fashion similar to factories, hence the title "Service Factory." These firms can take advantage of economies of scale and may employ less expensive unskilled workers as do most factories. Firms classified as service factories include truck lines, hotels/motels, and airlines. The upper right quadrant contains firms with a low degree of labor intensity but a high degree of interaction and customization. The upper right quadrant is labeled "Service Shop." Hospitals, auto repair shops and many restaurants are found in this quadrant. The lower left quadrant contains firms with a high degree of labor intensity but a low degree of interaction and customization. This quadrant is labeled "Mass Service." Mass service providers include retail/wholesale firms and schools. Finally, the lower right quadrant contains firms with a high degree of labor intensity and a high degree of interaction and customization. The lower right quadrant is labeled "Professional Service." This quadrant is similar to the upper left section of the Product-Process Matrix where job shops and batch processes are found. Doctors, lawyers, accountants, architects, and investment bankers are typical service providers that tend to be labor intense and have a high degree of customer interaction and customization. In 1994, Dotchin and Oakland proposed that in addition to the four categories: service factory, service shop, mass service and professional service, a fifth category should be added: personal service. They justify the inclusion by describing personal services as those directed at people, thereby high contact, as opposed to professional services which are directed to things, thereby, achieved with little contact time. On Wheelwright and Hayes' Product-Process Matrix processes appear on a diagonal running from the upper left corner to the lower right corner. Firms that position themselves directly on the diagonal are seen to be the most efficient. Similarly, a notional diagonal can be said to run from the upper left corner to the lower right corner of the Service Process Matrix. Schmenner states that many of the segmentation steps taken by service firms have been toward the diagonal. The attraction seems to be better control. From the perspective of the matrix, need for control would be greater for service shops, which lie completely above the diagonal, and mass services, which lie below the diagonal. The need for control is not as great for service factories and professional services, as evidenced by the fact that the diagonal transverses each of those quadrants. Schmenner also states that most services that have changed their positions within the matrix over time have tended to move up the diagonal. This, of course, implies a decrease in the degree of interaction and customization and a decrease in labor intensity. Those firms most affected by a move up the diagonal would be found in the professional services where labor intensity and interaction/customization was high. Obviously, any move up the diagonal, be it with professional services, mass service, or service shops, would be a movement toward the service factory. The legal field, a Professional Service, is a prime example of "up the diagonal" movement. Most have surely noticed the increase of television advertising on the part of some in the legal profession. Other than personal injury, the most prolific amount of advertising seems to come from lawyers seeking cases involving bankruptcy and uncontested divorces. Obviously, these are the cases that require the least amount of customization. By handling this case "in bulk" the attorney also lowers the labor intensity by handling multiple cases in one trip to the court house and enjoys economies of scale just like a factory, a Service Factory. The traditional restaurant had a considerable degree of customization, customer interaction putting it into the Service Shop category. The fast food industry has taken restaurants into the Service Factory area through the dramatic elimination of customization and lowering of labor intensity. However, the degree of standardization may vary. Witness Wendy's where you can "hold the pickles; hold the lettuce, special orders don't upset us!" Also, hospitals have seen movement within the matrix. Consider Shouldice Hernia Centre in Canada, a hospital that specializes in one type of surgery so that customization is at it lowest, allowing them to run as a service factory rather than a service shop. Even banking has made movement toward the Service Factory with the universal use of ATMs. Retailing has also seen changes within the Matrix. Warehouse stores such as Sam's Club and Internet sales have allowed retailers to move from Mass Service to Service Factory by drastically cutting labor intensity. However, some have gone in the opposite direction by becoming full-service boutiques and specialty stores stressing customer interaction, customization and labor intensity. There are a number of proposed challenges for management that are inherent in a firm's position within the Service Process Matrix. For firms with low labor intensity, plant and equipment choices are extremely important, implying the need to closer monitor technological advances. Since capacity is some-what inflexible, scheduling service delivery is more important so demand must be managed. For firms with high labor intensity, workforce issues such as hiring, training, employee development and control, employee welfare and workforce scheduling are critical. Firms with low customer interaction and customization face more marketing challenges than other firms. The need to "warm up" the service dictates special attention to physical surroundings. For these firms standard procedures are safe to use. In addition, the classic managerial pyramid with many layers and a rigid relationship between layers is appropriate. Firms with high degrees of interaction and customization must manage higher costs resulting from lack of economies of scale. In addition, higher skilled labor costs more and demands more attention, benefits, quality of work life and benefits. The managerial hierarchy tends to be flatter and less rigid. While the concept of the Service Process Matrix is conceptual or theoretical in nature, it should be noted that in 2000, Rohit Verma conducted an exploratory study, using a broad sample of quantitative data, in an attempt to validate the idea that management challenges do differ across the different types of services represented by the quadrants of the Matrix. Verma's findings did not closely match the proposed expectations. Capital decisions, technological advances and scheduling service delivery are perceived to be more of a challenge in high interaction/customization. Conversely, hiring, training, employee scheduling, and loyalty were found to become less important at interaction/customization increases. The importance of managing employee career advancement and marketing of services increases as labor intensity increases. Capital decisions and fighting cost increases were found to be more important for the service factory and the service shop than for mass service and professional service. Starting new operations, workforce scheduling and managing organizational hierarchy were found to be more important for service factory and service shops. As such, only four of 22 management challenge relationships proposed by the Service Process Matrix were supported by the empirical analysis. Despite this, the Product Service Matrix continues to be the standard classification scheme utilized in service research. 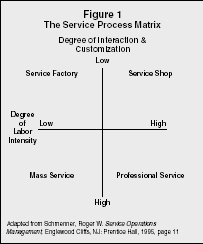 In 2004, Schmenner updated the Service Process Matrix by redefining the axes and the resulting diagonal. He had earlier stated that the lure of the diagonal was the need for control but later changed his mind. He stated that in retrospect, the issue was not control, but productivity that results from "swift, even flow." The concept of Swift, Even Flow argues that productivity increases as the flow of products and information becomes faster and variability decreases. Hence the X axis of the Service Process Matrix changes from interaction and customization to degree of "variation," in the sense that variation occurs in providing the service not that the firm provides a variety of services. Of course, interaction and customization are sources of variation. The Y axis changes from labor intensity to relative throughput time. Throughput time is the time that elapses between the services or facilitating good's initial availability until the service is complete. The Service Process Matrix is now represented by Swift, Even Flow: Swift = relative throughput time; Even Flow = degree of variation; rather than degree of labor intensity and degree of customer interaction and customization. Redefining the axes of the Matrix then causes the classification of services to change from the type service itself to the provider of the service. For example, in the previous Matrix, restaurants appeared as service shops. With the new axes, traditional restaurants are still service shops but gourmet restaurants could be considered professional service and fast food restaurants (with their quick throughput time) would be service factories. Hence, particular services may now be spread out in the Matrix. In order to improve productivity then, firms would strive to move left and upward or up the diagonal. The previously noted challenges for managers remain the same. Consider Southwest Airlines whose turnarounds are done swiftly with little variation. Although, not all services fit cleanly into these quadrants, it is instructive, providing insight into service productivity. It also provides insight into how service firms differentiate themselves from each other as well as helping to explain why successful service firms achieved their positions and maintained them. Dotchin, John, and John S. Oakland. "Total Quality Management in Services: Part 1: Understanding and Classifying Services." International Journal of Quality and Reliability Management 11, no. 3 (1994): 9–26. Schmenner, Roger W. "How Can Service Businesses Survive and Prosper?" Sloan Management Review, Spring 1986, 21–32. ——. "Service Businesses and Productivity." Decision Sciences 35, no. 3 (2004): 333–347. ——. Service Operations Management. Englewood Cliffs, NJ: Prentice Hall, 1995. Verma, Rohit. "An Empirical Analysis of Management Challenges in Service Factories, Service Shops, Mass Services, and Professional Services." International Journal of Service Industry Management 11, no. 1 (2000).